Karim Abuhamad is senior vice president of the Middle East region for Hunt Oil Company. He was previously vice president of the Middle East Region. 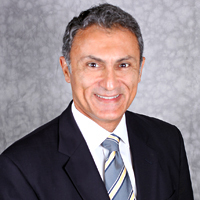 Abuhamad held roles within Hunt previously as the deputy general manager of development for Yemen LNG Company, LLC, vice president and general manager for the company's operations in Yemen, and before that, as director of industrial relations, pipeline manager, director of training and safety, marine manager and staff engineer in Yemen. He was also general manager for exploration projects in Madagascar and Niger. Before joining Hunt in 1987, Abuhamad was project controller for Gulf Interstate Engineering where he oversaw the retrofit of the Esso Japan tanker in Korea to become Hunt's floating, storage and offloading terminal for Yemen export operations. He was also chief offshore inspector at Gregory & Cook, an engineering firm, where he supervised the laying of an offshore pipeline for the U.S. Department of Defense's Strategic Petroleum Reserve. He started his career in 1980 at Brown & Root, Inc., where he worked as a construction engineer on various projects in Korea, Bahrain, Venezuela and Houston. Abuhamad is a member of the American Society of Mechanical Engineers and the Society of Petroleum Engineers. He earned an MBA in finance and a BS in mechanical engineering from the University of Houston. He is fluent in Arabic and French.